With all apologies to Jodie Foster and Lindsay Lohan (well, maybe not to LiLo — her version sucked), this is a feature that we are calling “Freaky Friday.” If you haven’t seen any of the incarnations of this movie, a mother’s consciousness is switched with her daughter’s and hijinx ensue. In our version, we will take turns dressing each other as we see fit. In this inaugural edition, I chose this ensemble out of L’s closet. 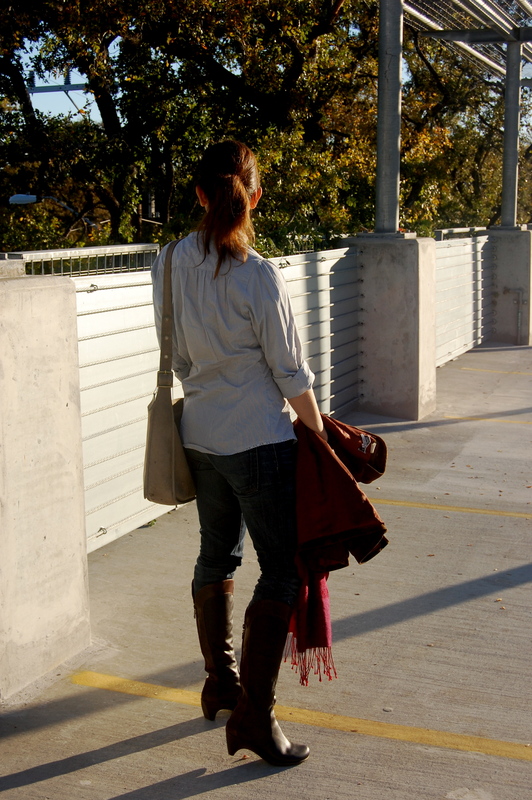 L has a great eye for finding vintage pieces that fit seamlessly into her wardrobe. Exhibit A is the suede blazer that she is wearing. The Current-Elliott jeans have made many an appearance here for good reason. They are as soft as they look in these pictures and can be dressed up as easily as they are dressed down. The Camper boots are among my favorites from her boot collection. I added a Paul Smith shirt that she found at a sample sale in London and a strand of pearls, to show how she blends contemporary pieces with older pieces to create a classic look. The accessories are no different. She found this vintage Coach bag at a shop in Albuquerque. To me, the quality of an all purpose bag like this can be determined by the signs of wear on its smooth surface. It has seen at least forty years of use, by various owners, and every stain and scratch flatters it like a duelist’s scar. It shows no signs of a pending retirement. 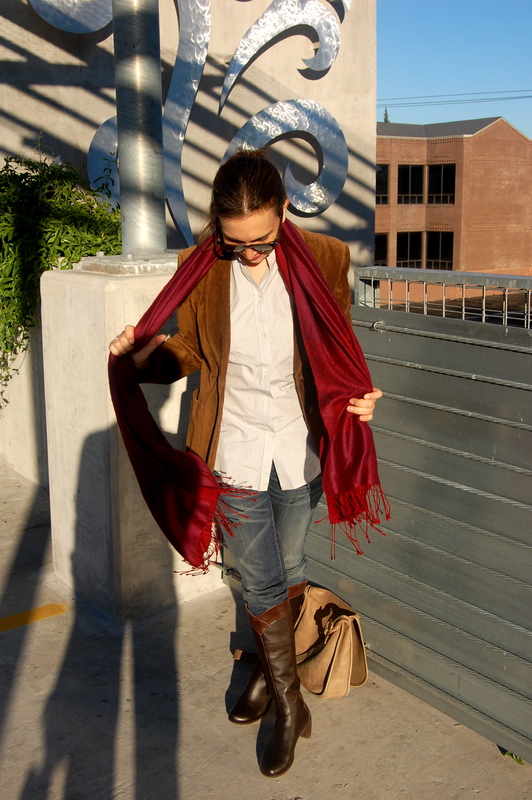 The crimson scarf wraps up this outfit like a bow. L found it at a shop in Istanbul and it shows a knack for integrating international pieces into a classic American style. This outfit serves not only as an introduction to L’s closet, but as a glimpse into her timeless aesthetic which graces not only these pages, but my life as well. This entry was posted in Freaky Friday, Hers, Outfits and tagged bonnie cashin for coach, camper, current/elliott, paul smith, ray-ban, saks fifth avenue, vintage. Bookmark the permalink.